Good medical care takes care of more than physical health; it takes care of the whole person-- body, mind, and spirit. Jesus cares for more than just the spirit of people. He cares for the whole person-- body, mind, and spirit. 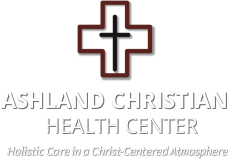 The Ashland Christian Health Center is a non-profit 501(c)3 faith-based organization. ACHC is a ministry of the people of the churches of Ashland County. Our volunteers use their gifts and abilities as physicians, nurses, and support personnel. These volunteers are dedicated to serving the whole person just as Christ loves us. The gifts and talents shared by these board members is a blessing in every sense of the word. Their dedication to the mission of ACHC is a perfect example of servant leadership.